At FloatWays we might be a little partial towards Oakley. However, we claim it’s with good reason. While it may be true you can buy better optics made out of glass instead of polycarbonate, the balance we get with Oakleys is hard to beat. Not so long ago I put together an Oakley Oil Rig review that was a good springboard to this one. It allowed me to set up a useful comparison for a more practical review this time around. To set the stage, I wore the Batwolfs for most of the Hot Rum Regatta we were competing in. I then switched to the Oil Rigs during the last leg of the race. Once we had crossed the finish line, I switched back over to the Batwolfs. This switcheroo proved to be a very good thing. I got an absolutely clear view of what I had going on with these sunglasses. The review is as much a result of a frame test as it is a lens test. This given the lenses were completely different from the Batwolfs to the Oil Rigs. The frame color was different too. While the frame color usually doesn’t matter, in this case it does. The Batwolf test subjects had a clear frame in contrast to the Oil Rig’s matte black. We expected the Batwolfs to be more comfortable because they would stay cooler – more on that later. We also expected the OO Black Iridium Polarized lens to be superior over the standard Black Iridium lens in the Oil Rigs. Of course, this is going to be a review and not a direct comparison. There are so many variables that a direct comparison would just be useless. 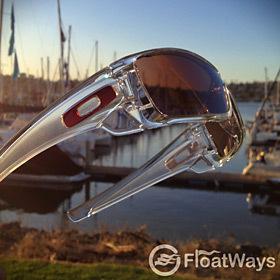 Clear and red might not be your first choice in a pair of sunglasses, but the Oakley Batwolfs still deliver in style. I picked up 2 pairs of standard issue Batwolfs in the same day. I already had an idea in mind. I had been looking forward to trying clear frame sunglasses for a while. Unless you order them custom, the clear Batwolfs come with an Ice Iridium (blue) non-polarized lens and metallic blue “O” logo icons. While I loved the metallic blue look, I was looking forward to a Polarized lens. That’s when the second set came into play. The donor set, was the same model but with a white frame and the OO Black Iridium Polarized lens used in the test. Given the little O icons on the stems can be interchanged, I added metallic red O icons to the mix. I thought they would look good with the somewhat rose tint of the G40 based OO Black Iridium Polarized lens. If you are wondering why I didn’t simply order them custom like that instead of buying 2 different pairs, it’s because as of right now, you can’t order them custom with this particular lens off the Oakley site. But Oakley did sell them with this lens as a standard issue that retails for around $220 as white frame, barcode O icons and OO Black Iridium Polarized lens as product number 009101-06. No exception in the Batwolf, Oakleys are usually highly customizable. I admit though, as soon as the blue Ice Iridium lens with the metallic blue icons went over to the white-framed glasses and the clear-framed ones adopted the rose tinted lens with the metallic red icons, the clear Oakleys got a little more feminine. But, I got over it pretty quickly and carried on. The Batwolfs in action. Once on, they didn't budge. Plus, the OO Black Iridium Polarized lens made the beautiful San Diego day more enjoyable. The Batwolfs proved to be better than I expected for sailing. I was anticipating bad fogging due to the full wrap and almost suction cup fit. However, I only experienced very little fogging. It only happened after a mad scramble to hoist and set the spinnaker. When settled in the cockpit, sheeting line in hand, I looked up at the curl in the sail and I experienced a bit of fogging thanks to how sweaty I had become. But, it only lasted for 2 or 3 seconds and the fogging was gone. Not bad. I can live with that for such a nice full wrap. 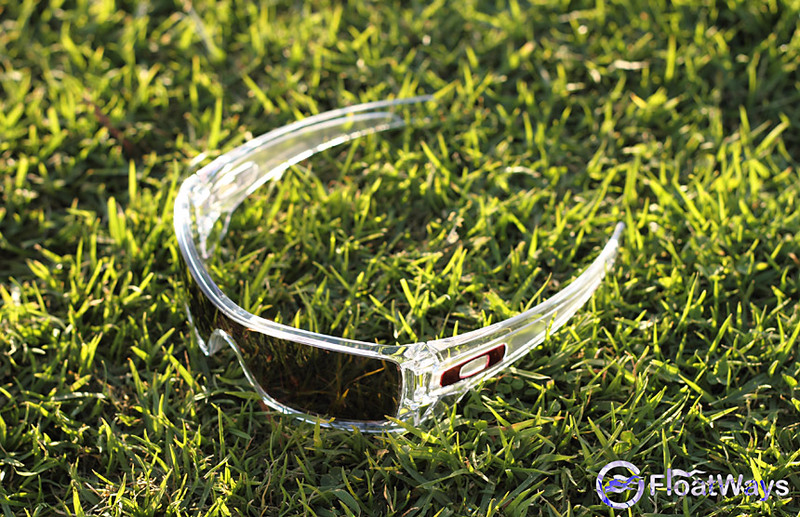 While the Oil Rigs tend to fit my face a little better, the fit of the Oakley Bat wolf is stupendous. It’s a frame that fits your face like a glove and there is little to no worry of them coming off and falling into the ocean. The stems are big and wide. They curve behind your ears in such a way that they won’t easily slip off even though they don’t hook like other more traditional sunglasses. 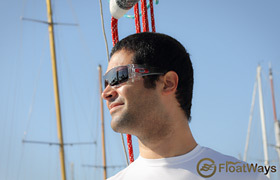 I would never attempt to sail with an aviator style pair of sunglasses for example. Those are almost guaranteed to want to live on the sea floor unless you staple the stems to your ears. But with the Batwolfs, I had no worries of dropping them. The clear frame has more plusses than minuses. I originally expected the clear frame would stay cooler better than the matte black frame in the Oil Rigs. Because of this, I expected the Batwolfs to be much more comfortable. Truth be told, on the boat it didn’t matter much. Not with the winds we had anyway. The cool wind made it so I couldn’t feel any difference. However, I don’t discredit the fact that on a windless sunny day, the clear frame would be more comfortable than a black frame. It’s simple physics, black absorbs light, thus it gets hotter. No need to argue that. The other nice thing about the clear frame is that I found the tan line around my eyes at the end of the day to be minimal. It’s still there. I look like a reversed raccoon, but the edge of the tan is not as defined as if I had been wearing black sunglasses all day long – A plus for the clear frame. At least it helps diffuse the mask-like tan line around your eyes. Admittedly, I don’t think the clear frames are for everybody. While some of the other crew members pointed out that they are nice because they are different, I wouldn’t be surprised if they really meant, “ridiculous, funny and girly.” Buy hey… if you think you can pull off the white sunglasses look, you can probably pull off the clear ones too. Like I said earlier, the Oil Rigs tend to fit me a little better. The Batwolfs press into my high cheekbones a little too much. I can tell a difference because I’m doing a direct comparison, otherwise I don’t think it would matter. Plus, this should mean nothing at all to you. For you it might be the other way around completely. So let’s move on. Now, what really impressed me the most was the Oakley OO Black Iridium Polarized lens. Going back and forth between the standard Black Iridium lens powering the Oil Rigs and the OO’s in the Batwolfs I was duly impressed with the OO’s. I’m a fan of contrast lenses. So again, I’m biased. But, I’m willing to bet that after a few hours wearing a contrast lens as nice as this one, you’ll be a convert too. The simple smoke, Black Iridium lens is just… boring – Especially over water. Everything looks toned down and flattened. A switch to the OO Black Iridium Polarized lens made everything pop. The day looked happier and brighter, yet not glaring and blinding. Yes, it might allow more light transmission than many guys will be comfortable with during extremely bright days, but for the most part it’s perfectly acceptable. If you are wondering more about the lens tint in the Oakley OO Black Iridium Polarized lens, let me put it this way. It’s the serious, conservative brother of the Oakley VR28 Black Iridium Polarized lens. 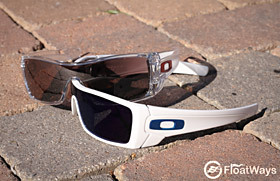 Supposedly, the OO lenses are derived from the Oakley G40 base. This means they are a rosy tint. However, when compared with the VR28 base, it’s not AS rosy. The VR28 lenses are bolder and the rose tint is much more obvious. Contrast is higher, but you pay the price with increased false coloring. Stuff simply looks more pink. The OO Black Iridium Polarized lens however, is much more civilized. Stuff still looks pink-ish, but not as much. Contrast is still amazing and color trueness is much better than thru the VR28 lenses. It’s still not a neutral lens, but it’s much more controlled. The bottom line is: If you are scared of the VR28’s obvious rose tint, try the OO’s. It would also make a great lens for someone coming over from neutral lenses to help ease them into a world of contrast. All said, the OO lens is a great option for the Oakley Batwolf Polarized. For those of you that prefer a bolder look (or are simply too much of a wuz to wear white or clear), maybe going with a black frame would be a better idea. But still, no matter the lens or frame color, the Batwolfs are a bold statement. The one-piece full lens helps cement that. I have to admit, the parts of the race I was wearing the Batwolfs with the Polarized OO lens were more enjoyable and better looking. Not to bash on the Oil Rigs, as I generally like that frame better, but the OO lens is just so nice! Too bad it seems Oakley doesn’t make the OO Black Iridium Polarized lens for the Oil Rigs. For those, you’ll have to settle with VR28’s or Gold Iridium Polarized. What about the blue Batwolfs? Now, what about the white-frame, metallic blue-icon, Ice Iridium Batwolfs I built with the pieces that came off the showpiece sunglasses in this review? Well, no point in going overboard with details on those. The fit is of course the same. So if you want white, get that instead of clear – and the Oakley Batwolf icons can be whatever you like. 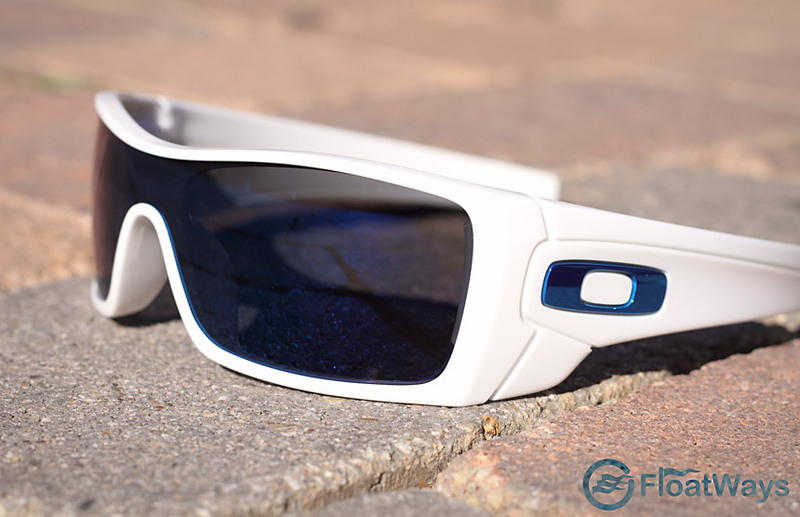 Oakley has tons of different colors available for those. As far as the Ice Iridium lens goes, from the inside out there is not a whole lot of discernable difference between those and the standard Black Iridium Oakley lenses. The only real difference is looks, and those come from the outside. The blue tinge is VERY minimal from the inside out. I admit, the reflective Ice blue Iridium coating looks badass and is as cool as the other side of the pillow. I admit, the reflective Ice blue Iridium coating looks badass and is as cool as the other side of the pillow. However, I simply cannot put the cool factor over optics. I prefer the optics of OO, Bronze, VR28 and Polarized lenses altogether and for that reason can’t seem to fall in love with Oakley’s funky colored Iridium coatings. Now, if Oakley would put colored Iridium coatings over their polarized lenses more often – THAT would be grand! In which case, I’d take Batwolfs with an OO Ice Iridium Polarized lens please! It'd be nice if Oakley made more color Iridium lenses with polarization, but even without it, the Ice Iridium is a pretty good lens. 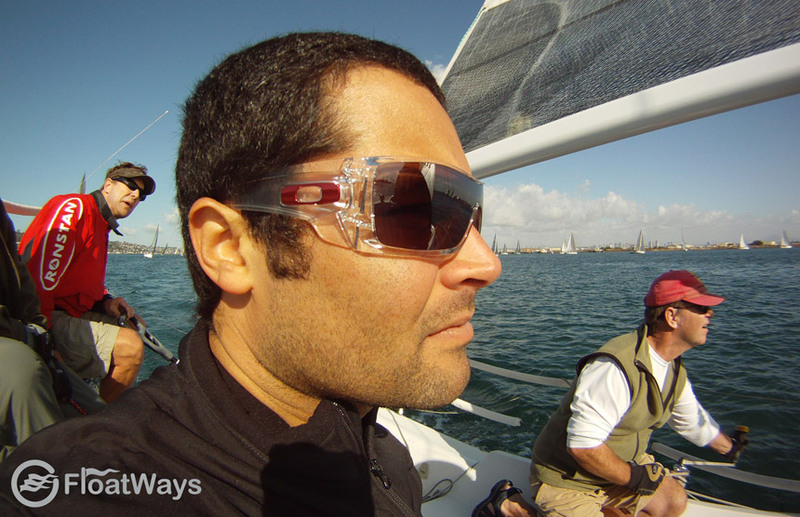 To conclude, the Batwolfs check every single box in the requirements for a good pair of sailing sunglasses. If you are wondering what those requirements are, read the detailed story here. If you look at the listings, they have a large array of Oakley Batwolfs and even individual lenses, just in case you want spares or different tints.